Andrii Dehtiarov is from Ukraine and has been living in London for three years, working as an Engineering Manager for Google. He has a passion for languages and linguistics and, as a life-long learner, had already studied English, French, German and Russian as foreign languages. However he wanted to learn another Slavic language, but from a different subset than Ukrainian – Andrii needed a new linguistic challenge but was also curious as to how long it would take to learn a different language, but one which shared some common roots and grammar with his native language. He chose Croatian, rather than, say, Polish, because he felt Croatian would be a harder challenge and Croatia was a country he knew little about. 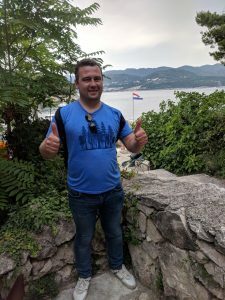 After considerable research he chose the Croatian Language School [CLS] to help him achieve his goal and started a course of Skype lessons in October 2017. 1. Had you already visited Croatia before you started learning the language….and since? Was it how you expected it might be? I hadn’t visited Croatia, or any country it shares borders with on the Balkan peninsula. I thought I would first get my feet wet with the language, and then visit the country after a few months of learning. Knowing some basics would allow me to practise the language more sensibly than not knowing it at all. At the same time, postponing the initial immersion into the native environment for too long would not be great, because I am convinced that some ‘bad habits’ in pronunciation or grammar might get entrenched if I didn’t get my language calibrated in real life with real people in the country where that language is spoken. Of course, tuition with a professional native speaker at CLS helps a lot, but, at the end of the day, you want to speak to as many people as possible and hear various voices / styles / dialects / accents, as it boosts your understanding of the bigger picture. 2. What made you decide to choose CLS to help you achieve your ambition of learning Croatian, rather than perhaps finding a class, or another school, or trying to teach yourself? After doing my initial Google search, I ended up with a few options, but CLS seemed to have good reviews and a professional and up-to-date website, which led me to make an inquiry. I remember that was on a Saturday, so I sent the email and wasn’t expecting a response until the following week, but was pleasantly surprised when I received a response within a couple of hours, which answered my questions and outlined suitable learning options for me. At that point, the school choice became obvious. 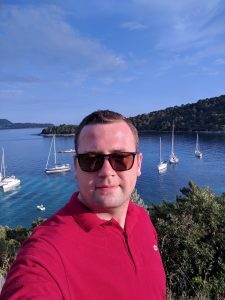 Later on, I experienced more pleasant surprises, for example, a few months into studying, I was offered an opportunity to join a language and culture immersion trip to Croatia. It was planned well in advance, appeared to be perfectly organised, and all that at an affordable price. 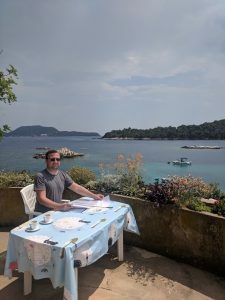 I had a great time and got invaluable language experience – both intensive open-air academic lessons overlooking the Adriatic coast on one of the tiny islands, and also exposure to day-to-day Croatian life in our leisure time. After the trip I felt I could change my programme to a more challenging one, and again CLS quickly offered available options and accommodated my individual needs and wishes. All in all, the CLS experience has been great and I have never regretted my choice. 3. Could you give us an idea of the progress you have made in the language since you started as a beginner? The short answer is that at the end of my second visit to Croatia I was able to maintain conversations with native speakers in day-to-day contexts. Once we spoke for about twenty minutes with someone, and when I asked whether they could hear that I was not from Croatia, they were genuinely surprised and said that they thought I was from Zagreb 🙂 Other people I talked to either said that my parents were “probably Croatian”, or that I “probably live not too far away from Croatia”. It wasn’t all roses of course, and I ran into a few funny situations when I mistakenly used some of the many so-called “false friends of the interpreter” – a word which is virtually the same in both languages [Ukraine and Croatian], but means completely different things. Worse still, some words have different language levels, for example what is a regular word in one language, may be considered obscene, impolite or otherwise to be avoided in the other. However, it is my firm belief that one can only truly learn if one practices and that means making mistakes. They are an inevitable part of a quality learning process and I discovered that, as long as I stay respectful and open-minded, people would be quite understanding or even happy to help. 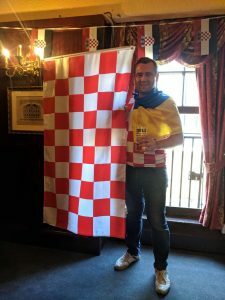 A polyglot Ukrainian in London supporting Croatia in the World Cup but adoring France too: both sets of fans at the same pub but on different floors! 4. Given your existing linguistic ability and knowledge, how would you compare learning Croatian to learning, for example, French, German and Russian? Which other foreign language helps most with Croatian? Certainly knowledge of Ukrainian and/or Russian helps, because the languages share common roots. It’s interesting that during my first couple of months of learning Croatian, the language sounded to me like a somewhat ancient and poetic Ukrainian. I even discovered, in some cases, that if I didn’t know how to say something in Croatian, I should think how a Russian poet would say it 200 years ago, and many of those guesses were either precise or quite close. Of course, there are a lot of words whose meaning I’d never guess without a dictionary, but it is amazing to observe such language interconnections and have these cross-linguistic experiences. If I were to compare my Croatian and, say, French learning experiences, I’d say they are very different but almost equally challenging if you want to get things right. As I mentioned before, Croatian and Ukrainian share some common roots and that helps, but there is a flip side and that’s the overwhelming number of the aforementioned “false friends”. Also, some grammatical constructions, like the noun and adjectival endings for the cases, are “close”, but this proximity only complicates things. Imagine someone takes all you have known and used for decades, shuffles it in some random order, and declares a new set of rules. You have to try even harder because, not only do you have to learn the new thing, but also be careful to disconnect it from what you already know in a different language. My French learning experience was not like that, since French belongs to a completely different linguistic group from Ukrainian, but it posed a different set of challenges. For example, phonetics: in Croatian you typically pronounce the words exactly as they are written, but in French, the verbal and written norms are two completely different universes. 5. Is the course with CLS meeting your expectations? Yes, absolutely. I would say it even exceeds them, given all the pleasant surprises I have experienced during my year or so with the school. 6. What do you enjoy most about learning Croatian with CLS? Their professionalism, flexibility and many years of experience, as well as the multi-faceted programme and friendly community. All that comes across every time I interact with the school. Also the base in London is convenient although Skype lessons are an effective option and save travel time. At my “desk” learning Croatian! 8. What would be your top tips for anyone else learning Croatian as a second, third, or even sixth foreign language?! I think it’s very individual, as different people often have very different backgrounds. However, I am firmly convinced that the human brain is very powerful and capable of so many things that we often don’t realise its full potential. Learning languages certainly helps to keep that powerful system in good shape, because, in my opinion, a language defines a system of thinking. So imagine you merge many existing systems of thinking into one, having them work for you and complement each other, all that being in your head. It massively enriches the set of neural connections and also gives a new flavour to life. (e) get exposure to the language in various forms and explore the ways you can easily achieve that, for example why not use your handheld devices, say, by switching their language from your native language to the language you’re learning?. Also try songs, movies, books, news, travelling. And finally, speak, stay open-minded, be respectful, and of course be ready to make mistakes, and lots of them! It’s fun and part of the learning process. 9. What are your plans in terms of carrying on with the Croatian language and getting to know Croatia better? I have extended my learning programme with CLS by another 30 hours and plan to visit Croatia again some time soon. In the meantime, I enjoy Croatian music and read some Croatian news.